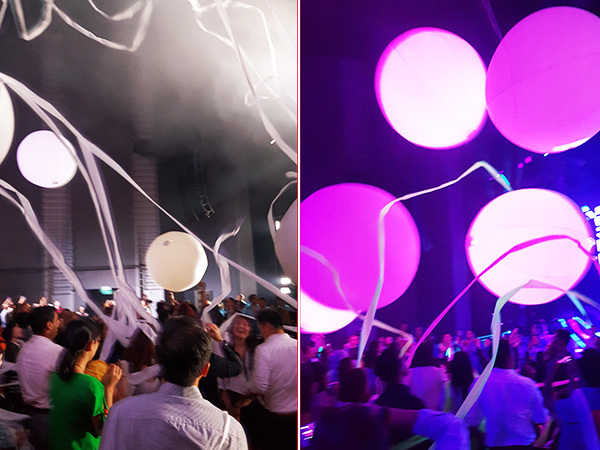 The Blue Man Group is one of the most interesting performance I caught at the Marina Bay Sands Mastercard Theatre – it is not exactly a musical like Wicked or Cats where there is a storyline which you can follow. The Blue Man Group has the standard scenes which it is well known for e.g. what you see in the picture below where they play drums with different colored ink droplets splashing upwards. Other than that, there is a lot of randomness in their act, mainly because of the highly interactive nature of the show. The Blue Man Group is branded as comedy, theatre, rock concert and dance party all rolled into one and indeed you see a lot of those drumming and making a lot of Stomp-like noises with pipes, barrels etc. 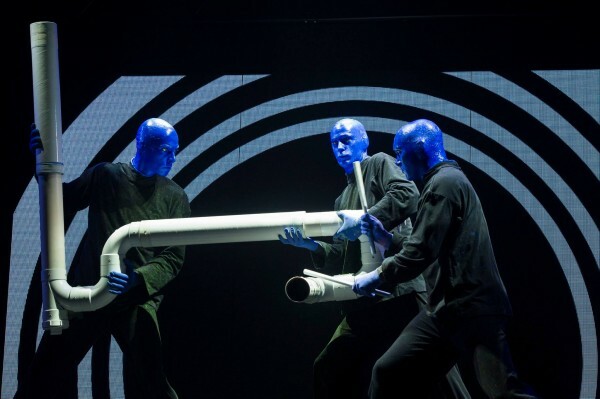 This is the first time that the Blue Man Group is in Singapore, although they have been successfully showing in Broadway and on the Las Vegas Strip for the past 25 years. The performance starts proper at 8.15pm but do look up at the small digital signboard with rolling words on the left and right uppermost corner of the stage – you will find the usual – turn off your mobile phones but the rest of the words are just hilarious – something to keep yourself entertained while you wait for the show to start. Once the performance starts, these 2 signboards play a major role in audience participation – find out for yourself when you watch the show. Do note that there is a “splash zone” for the seats at the first 2 rows – if you are seated there, you will be provided with raincoats. You won’t get very wet like “Singing in the Rain” type of splash zone wet though. 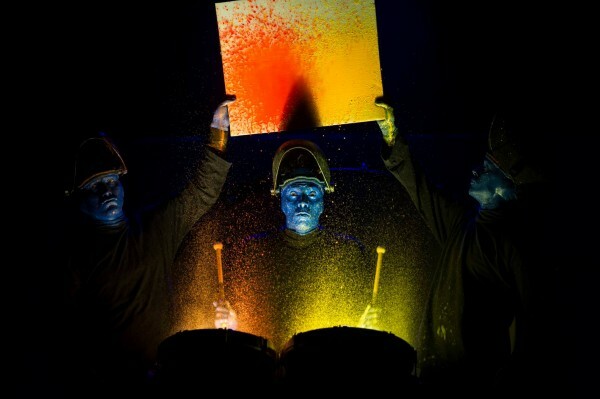 There is no intermission break for the Blue Man Group performance so expect lots of non-stop actions and excitement from the Blue Man Group from 8.15pm to 9.45pm! When I say “audience participation”, I really mean “audience participation” – random audience member get arrowed to go on stage to perform with the Blue Man Group – if you are seated at the Stalls, there is a high chance that you will get arrowed to do something with the Blue Man Group, be it on stage or off stage in some funny antics. 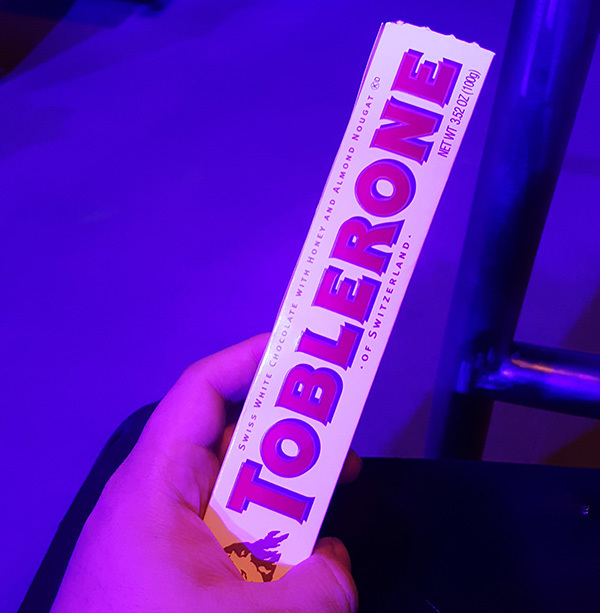 I was myself arrowed before the show to hold a stick of Toblerone (with strict instructions not to eat the 3 pieces of white chocolate Toblerone inside) for the audience participation segment. I am thankful that my only role was to hold it (which was eventually snatched away by one of the Blue Man when they came down for that particular segment – the other audience member had it worse (i will just leave it as that – experience it for yourself :-)) Hint: it has something to do with the marshmallow throwing segment on stage for one of the earlier acts. This is perhaps the only show at the Marina Bay Sands theatre where you are encouraged to freely take selfies (do so only when prompted or when the Blue Men come down from the stage to interact with you). One part of the Blue Man Group show which I bet everyone enjoys is the part where giant balls come floating around the audience – you get to push them away as they get pushed from somewhere else towards you. Do look out if you are taking pictures as you never know when a ball is around the corner! “Reconnect with your inner child, re-experience mischievousness and sheer joy, and see what fun three guys can have with 30 litres of paint and 55 mashed-up bananas in the space of an hour and a half!” – that’s what the sypnosis of the Blue Man Group performance says and it cannot get more accurate than that. 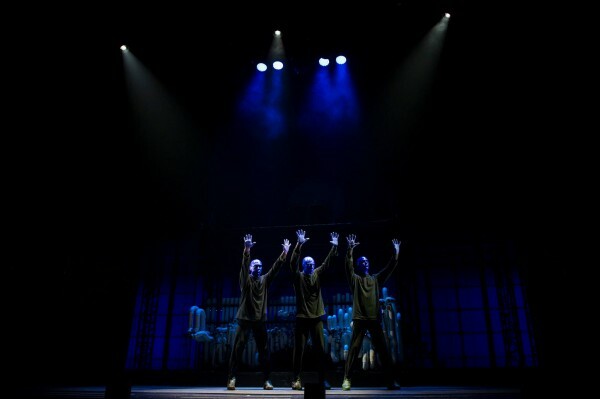 Chuck your mental model of a typical Marina Bay Sands musical aside and get ready to have fun and participate actively in the Blue Men’s funny antics and you will have a good time at this performance! The Blue Man Group is showing at Sands Theatre, MasterCard Theatres at Marina Bay Sands until 24 April 2016 (last show 7pm). So don’t miss it! Hi all l saw the show in Macau. It was the worst stage show l Hv ever attended. Slow, moronic, gross at times and totally meaningless. I must add boring as well! but l cld tell you after the first act it was a mistake. What a disappointment. Sands you can do better than that.